Killik Vital Hunting Pant – This is the foundation, the reason for it all. We wanted to create a soft, lightweight, abrasion resistant, highly breathable pant that moved with us. This pant shines in early- to mid -season hunting conditions and when paired with a base layer it carries you into frigid hunts as well. Vital: the name says it all, purely functional and extremely flexible, this series is a “must have”. 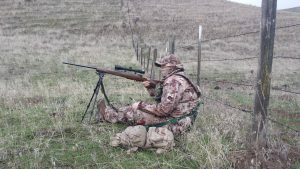 Killik Nexus Hunting Jacket – In that moment when the prize buck is in your sights and you are squeezing down on the trigger, the last thing in your mind should be whether or not you are fully concealed from his view. Ensuring the utmost concealment at both close and long ranges, the Highlander camo from Kryptek is designed for the most varied geographical regions and elevations increasing your stealth on any terrain. Killik! What’s in a name, right? Well if you’re looking for a top notch camo clothing company, quite a bit I would say! It is a safe bet that if you’re pulling camo out of your wardrobe you are probably a hunter. Camouflage aids in our ability to stalk, hide and ultimately kill our prey so choosing a company with your end goal written into its name seems like a no brainer. I recently acquired two products to test from the good folks at Killik. I was sent the Vital Pants and the Nexus Jacket. Upon first inspection both seemed to be of the highest quality material available. To be honest, I am currently in love with the Kryptek camo pattern so they were aesthetically pleasing to me right away. The pockets that are equipped with high quality zippers were a refreshing and well thought out design. To be plain, the camo just looked good! The true test is, of course, once you get it on. The best looking camo in the world will do no good if it does not fit or is uncomfortable. Killik is not only a great fit it is also as comfortable as pajamas. The pants were snug yet comfortable in the waist but roomy in the legs. They fit great and after having a little camo yoga session in my living room I was ready to get out and put them to the test. I loaded my truck and out I went to chase the ever allusive coyote. My day was planned out and the hike took me into a wide mixture of terrain including river bottoms and grassy hills. I crossed over fallen trees and walked through thorn patches. 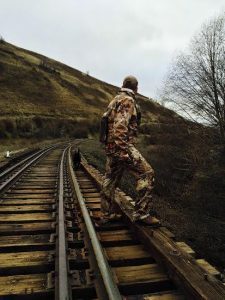 I went up hills and down railroad tracks; each mile was a new test and each stand a chance to rest and evaluate my new camo. The jacket was absolutely amazing and I love that it has a lower cut in the back. When sitting in a coyote stand some of my other jackets tend to ride up and expose that area plumbers are famous for. Such was not the case with this jacket. My back stayed covered and the cold January air never found its way in. The only gripe I have is that my neck is not overly large and even when zipped all the way to the top the neck has quite a bit of room. This was an easy fix that I solved with a neck gator and never gave it a second thought. The pants are simply the most comfortable pants I have ever worn. The stretch ability of the fabric keeps them from binding up when crossing logs or stepping up onto rocks. As far as comfort goes I would give these pants an A++. There are a few things that I would like to mention though. I am a HUGE believer in having the right gear for the right situation. With a good base layer I was comfortable into the mid 20’s.That said these are not extreme cold weather pants. If you are looking for pants to use in cold climates these are not it. But that is not what they are designed for. These are also not puncture proof pants. If you will be going through lots of thorns you will definitely feel them. The light weight pants are not ideal for that. I did find myself in a thorn patch and it was an adventure, to say the least. Let’s focus on what they do well, and that is allow you to move unrestricted over every conceivable obstacle. If you are looking for a comfortable pair of pants that will bring you from the September archery season to the early winter and provide extreme comfort these are the pants for you. The Killik camo that I tested was great. I am a believer and will likely soon be changing all my camo out to Killik brand. If you are in the market for new camo I would highly recommend giving them a try. The Killik camo is really top notch and there is not much in the area of design that can be improved on. I do have a personal preference for deep pockets and the pants have somewhat shallow pockets. I would like to see them made slightly deeper. I also noticed that due to the fabric used and the loose fit I had a slight issue with noise as my legs moved past each other. It was only really noticeable while walking fast, however, if you are stalking that shouldn’t be an issue. I recommend the Killik brand without reservations and truly believe it is on par with the highest quality camo clothing on the market.